Carrie Vaughn is the bestselling author of the Kitty Norville series, as well as the superhero novels Dreams of the Golden Age and After the Golden Age, the young adult novels Voices of Dragons and Steel, and the fantasy novel Discord’s Apple. Her Hugo Award-nominated short fiction has appeared in many magazines and anthologies, from Lightspeed to Tor.com, as well as in George R.R. Martin’s Wild Cards series. She lives in Boulder, Colorado. Learn more at carrievaughn.com. Amazing and compelling, Vaughn brings her deft characterization and humanity to bear on a post-apocalyptic world that is all too real. My favorite post-apocalyptic story in a long time. The story is well-paced with a compelling mystery, plenty of tension, and escalating stakes. It also has kindness, heart, layered characters, and cool worldbuilding, with a post-climate change pastoralism that reminds me in some ways of Leigh Brackett’s The Long Tomorrow (a touchstone post-apocalyptic book for me). These are gorgeous books… Written in spare and compelling prose, they are quiet, introspective murder mysteries, deeply invested in ethics and in kindness. Skillfully portrays a vastly altered future America. [The] focus on sustainability and responsibility is unusual, thought-provoking, and very welcome. Are any of your friends or family greenies? No, I’m not asking in the usual sense—although if they are Martians or other aliens, please introduce me. I’m wondering if you know any environmentalists. Because I’ve got a book they’ll surely like. […] Carrie Vaughn’s future society is well-realized, almost utopian in many aspects. She tells Enid’s story in parallel narratives: one stream follows present-day Enid as her case progresses; the other takes us back to Enid as a teen in this reshaped world. It’s a powerful technique for exploring the history of the community, as well as showing how Enid took the path to becoming an investigator. 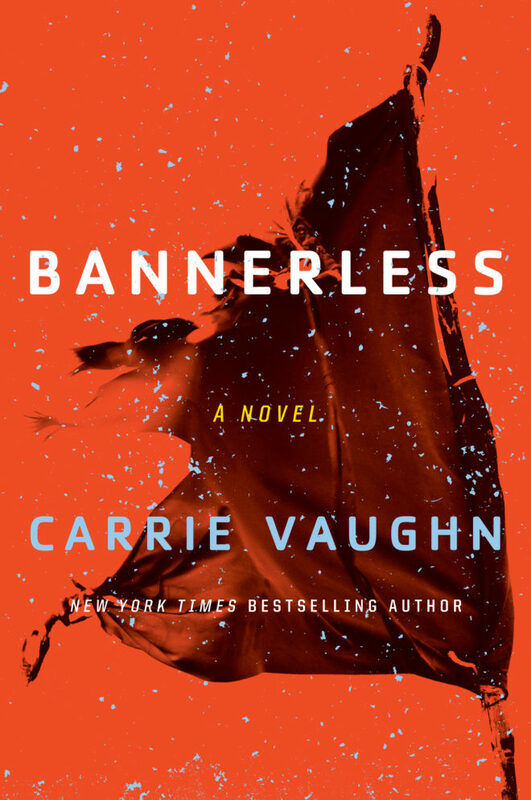 Bannerless is both a fine murder mystery and a multi-layered look at a different kind of society. Despite the worldwide apocalypse, this is actually a deeply personal story about one woman and the mores of small-town living, a deft portrait of a society departed so completely from the complexities of the now-destroyed civilization (except for some technological scraps) that survivors don’t even understand what it is they’ve lost. [. . .] Well-crafted and heartfelt. A compelling, deft post-apocalyptic tale. Vaughn weaves an all-too-believable account of “The Fall” of a modern world that required constant upkeep to continue functioning. Enid is flawed but earnest in her angry disbelief at others’ abuses of the system that was put in place to prevent another Fall from happening. A quiet mystery combined with an introspective look at a possible future, ideal for fans of genre crossovers. Octavia Butler’s Parable of the Sower mixed with a modern procedural mystery […] Wonderfully intriguing. Totally fascinating as a thought experiment and compulsively readable.